It was one summer afternoon and my wife and I had just returned from shopping. We have a daylight basement that I call my "man cave" where I have my high definition television, a pool table and on the far wall across from the door we have a roll top desk that was built by a friend of ours as a gift. 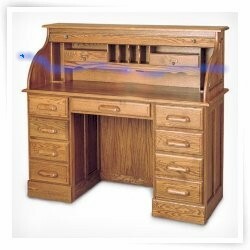 It was the area around and on this desk we witnessed a blue streak of light that lingered for about 3 or 4 seconds. We play pool occasionally, however, our pool table is used as a drop off point since it is near the door that opens into the garage. On this late summer afternoon we walked in, my wife directly behind me, to drop our bags off on the pool table before heading upstairs to prepare some lunch like we have done so many times before except this time we had this strange blue light experience. Above our pool table we have a wicker pool table light suspended above the playing surface from a chain. This particular pool table light had regular incandescent light bulbs in it so occasionally we would have one of them "pop" or burn out when we would turn on the switch. Nothing abnormal about that as we have all seen what it's like when a bulb flashes its' last flash before burning out. My wife's view of the roll top desk was blocked as I stood directly in front of her as we entered the "man cave", however, she could see the areas to the left and right of the desk. The room was dark, like all man caves should be, and I saw a blue streak of light move from right to left across the desktop. It was so bright and self-illuminating that it cast a shadow on the desk as it moved across. There were shadows from the pencil holder and other items sitting on the desk that cast back against the back wall of the open roll top. There was no mistaking that this light source was real. It traversed the desktop and as suddenly as it appeared it vanished just a few inches past the left side of the desk. When I asked my wife if she had seen what I saw she replied, "I saw the illumination of the area, it was bluish, it seemed to cast shadows on the wall, but I thought that you had just turned the pool table light on and one of the bulbs had popped as they sometimes do". The pool table light had not been turned on and to add to the mystery there is absolutely no power in that section of the room. This remains a total mystery to this day. Any ideas on what we witnessed that day? Last update on November 23, 10:53 am by CJ. Alfred E Neuman and Admin	like this.